Kartik Aaryan and Sara Ali Khan are shooting for Imtiaz Ali's next directorial film and the reports their shooting is in the buzz these days. The interesting thing was that there was no official announcement regarding the film happened and Kartik-Sara started the shooting of the film secretly in Delhi. Now finally the makers have made an official announcement regarding the film and they also shared the first look of the film. Trade analyst Taran Adarsh shared the first look of the film featuring Sara Ali Khan and Kartik Aaryan and shared the film will release on Valentine 2020. 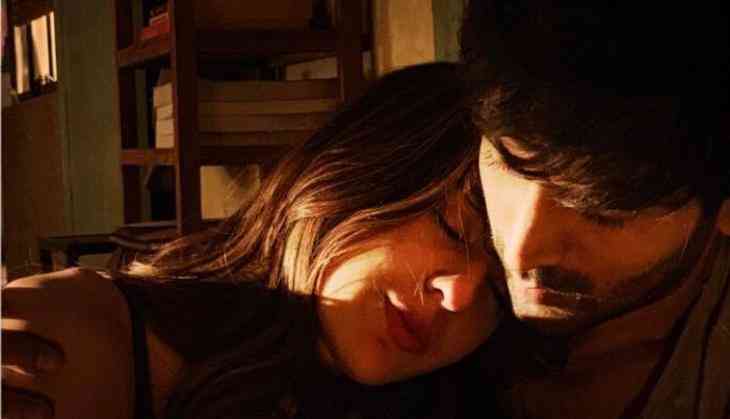 Taran Adarsh tweeted, "Kartik Aaryan, Sara Ali Khan and Randeep Hooda... Imtiaz Ali's new film [not titled yet] to release on 14 Feb 2020... Jio Studios, Dinesh Vijan's Maddock Films, Imtiaz Ali and Reliance Entertainment’s Window Seat Films will present the film... Shooting in progress." The interesting thing is that during the promotions of her debut film Kedarnath, Sara Ali Khan openly accepted that she has a crush on Kartik Aaryan. Then the reports of their affairs went viral on social media and even Kartik Aaryan on Koffee With Karan accepted that he is in touch with Sara Ali Khan. Talking about the film, Imtiaz Ali is coming back to direction after the disaster of Jab Harry Met Sejal starring Shah Rukh Khan and Anushka Sharma.